Singers are often thought to be ‘delicate’ compared to other musicians. But because our body is our instrument, we have to take special care of it. This means that we cannot practice in the same way, or for the same amount of time that other musicians practice. Still, there are many ways to practice our music, that don’t actually involve singing. Silent practice affords the singer a new perspective on the music. Instead of focusing on vocal production, singers can focus on breathing, placement, their interpretation of the music, the subtleties of language, and much more! 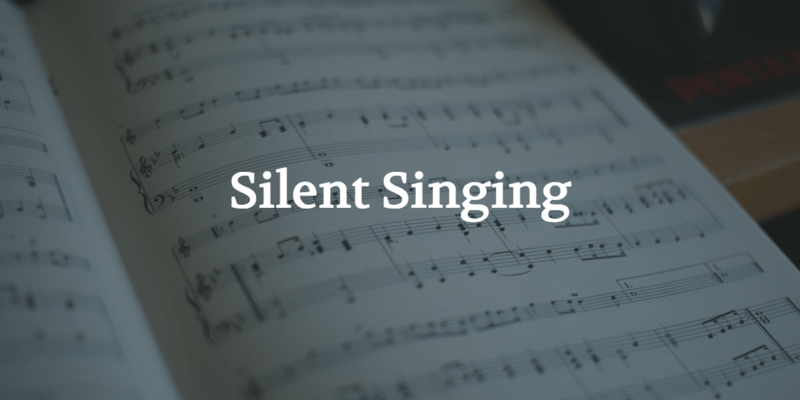 Silent practice is beneficial not just when a singer is sick, or their voice is fatigued, but it is an important aspect of practice to highlight other areas of singing! Language is such an important aspect of music. Even if a piece is written in a singer’s native tongue, there are a myriad of differences between singing language and speaking language. Silent singing allows singers to practice these subtle differences in a focused an deliberate manner! One of the greatest benefits of silent singing is that it can be done almost anytime and anywhere! With headphones on the bus, in a coffee shop, even at the library! This ability to practice in virtually any environment, at any time, means singers can practice just as much as any other musician, just in a different manner. How else can silent singing benefit us? Tell us in the comments below!